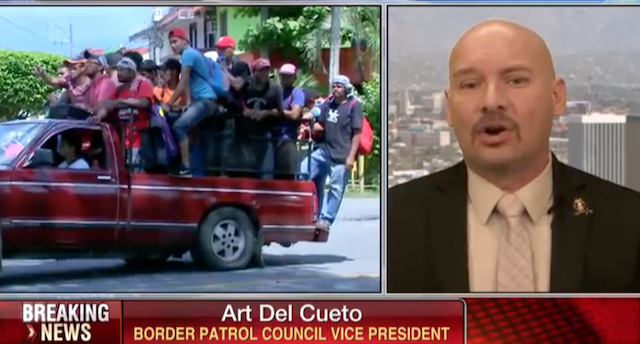 Thank you Art Del Cueto, Border Patrol Council VP, for saying what so many in the media and politics are afraid to say about this “migrant caravan”, conveniently organized weeks before the most important midterm election, headed to the United States. Those following this story closely already know this, but for Americans not paying close attention you need to take notice that the majority of “migrants” headed to the US are MEN.. young men of fighting age; very similar to what we saw happen with middle easterners trek to Europe. This “caravan” is composed mostly of men, who are allegedly escaping countries they deem are oppressive, yet these people are proudly waving said country’s flag as they head to the USA! We need troops deployed to the border to stop this invasion, and no libs I don’t care if it truly is a family of four trying to enter. They failed to seek asylum in Mexico, defied that country and now think they can come to the US!? Don’t think so, and this patriot supports any action taken by Pres Trump to stop them. We have no idea who any of these people are, again mostly men. Are the MS-13, Sinaloa, Medellin, Gulf, Los Zetas cartel members? How about al Qaida, Hamas or ISIS fighters? Because you do know middle easterners blend in perfectly with latins! Are the few children traveling with these people really their kids or are they part of a human trafficking organization? Again we have no idea, so this invasion must be stopped even if that means this American and many like him have to line up at that border shoulder to should with our troops and border patrol!